The Better Way To Chlorinate, a Spa or Swim-Spa!!! 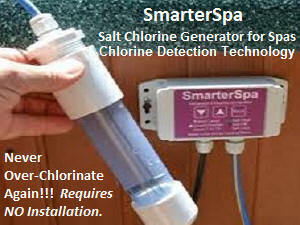 Using a Salt Chlorine Generator, in a spa or swim-spa. The use of a salt chlorine generator is a more effective and convenient way to use chlorine, as compared to traditional chlorine products. It eliminates many of the odor problems, associated with chlorine and ends the handling, measuring and storage of chlorine. Several no-installation-required models, are available for all types of spas. Two models are smart enough to only produce chlorine, when it is actually needed. The required amount of salt is about as much as is present in a human tear. 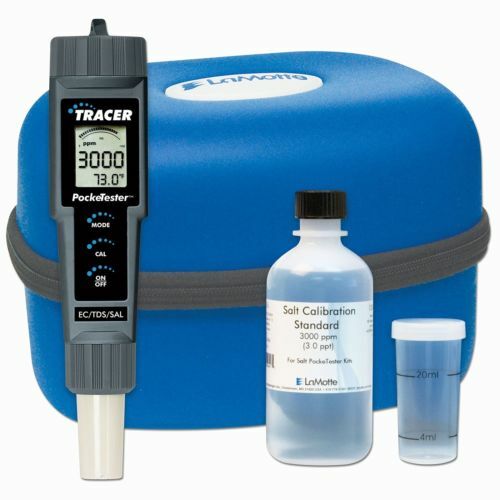 An Electronic PockeTester Kit is a convenient way to measure the salt level, as well as test for other water chemistry test factors. How to use a salt chlorine generator, in a spa? Salt Chlorine Generators, also referred to as Salt Chlorinators, Saltwater Chlorinators or Salt Chlorination Systems, are actually miniaturized chlorine manufacturing plants, with the same technology being utilized. The devices work by electrolytically converting salt, in the spa or hot tub water, into chlorine as it passes over specially coated titanium electrode plates. Salt must be added to the water prior to start up, as directed. Thereafter, salt need only be added occasionally, to replace that lost due to splash out, pump outs or backwashing. The device generates Free Chlorine and destroys odorous and irritating chloramines, as the water passes over the salt-cell plates. Chlorine production is regulated by a controller setting and the equipment operates in conjunction with a timer controller. Properly used, there is much less sensation of chlorine being present. The other water analysis parameters must be maintained, as with any chlorine-maintained spa or hot tub. It certainly is easy-to-use and convenient and lends itself to automation. If problems arise, refer to the Spa Problems Page, as a source of problem-solving information, broken down into various categories. Scroll down the page and click on the linked keywords, catch phrases or images, in the archived answers below, to access additional information, on that topic or product. ► Spa Salt Chlorine Generator? A friend of mine has a salt water pool and seems to have a easy time keeping the chlorine level in range. Is this technology available for use in a spa? Is it available as a retrofit or must the spa be ordered that way? Thanks for the help. Actually the pool is not a salt water pool. Salt is added to the pool, but at a fraction of that present in true salt water. Salt Chlorine Generators are available for use in spas and offer similar advantages: complete elimination of chlorine chemical products, easy maintenance and improved water quality - just to name a few. It can be added to an existing spa. If you are interested in eliminating or reducing that unpleasant chloramine odor, a Salt Chlorine Generator is a suitable means of alternative spa water sanitizing and should be of great interest. If this website was helpful, in solving your problem, please consider joining our E-Letter Mailing List. You'll receive E-Letters, with helpful information, new product updates, suggestions and sale announcements. I hope that I have provided the solution. Alan, thank you! Your website is such a big help. I am a new owner of a 20'x40' in ground vinyl lined pool and a 500 gallon spa (separate). This has been a 'night-marish' summer just getting the projects completed and now I am into the daily maintenance and care of both the pool and spa. The pool builder set up the pool initially using stabilized Tri-chlor 3" chlorine tablets administered by an automatic chlorinator. My pool has an automatic cover and is closed except when in use. I tested weekly and unbelievably did not have to add any chlorine tablets the last 6 weeks of the season! Can this be true? The Cyanuric acid levels are extremely high and with minimal loss of chlorine thanks to the cover, my strips were correct as confirmed by professional analysis. This fall I added a spa and this dealer insisted on setting up the spa using a 5% copper product to sanitize the spa. I have been reading many cons to using copper as a sanitizer, most stating that copper is an incomplete sanitizer. Being new to this industry, I feel like the advice that I receive is all about selling the chemicals. I am looking for a truly impartial opinion to sanitizing and oxidizing both the pool and spa. 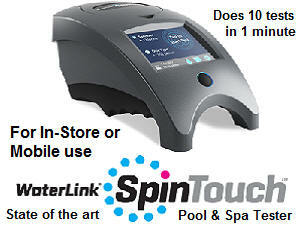 With no consideration to cost, what would you use to sanitized and oxidize your pool and spa? My region is North Central West Virginia if that matters. The winters are cold and the summers are hot. Thank you for your time. You would need a magnifying glass, to find something that makes good sense about the use of copper as a spa sanitizer. I am perplexed that, given all the better possibilities, copper would be recommended, by any truly knowledgeable, objective person. Copper is a primarily algaecidal and will not control the infectious bacteria, that may develop in spas very quickly. Copper not oxidize the wastes. Another excellent way to sanitize the pool and the spa is with a salt chlorine generator, which will produce chlorine right in the spa. There is no need to add a separate oxidizer and it is highly automated. This is a complete sanitizing system. Fewer chemicals to add and store, fewer chemicals building up and conditions that are less likely to lead to heater corrosion. Given the chemicals saving, the end result is quite affordable. I hope that you will find the information helpful. ► Goldilocks Wants It Just Right? Call me Goldilocks, but how do I get the chlorine level, in my spa, to remain within the optimum range? I want it "just right". Not too low and not too high. When I find the level too low, so I add some dichlor product. Then, it is too high. Isn't there an easier way to do this? Please help. Generally speaking, salt chlorine generators provide more control, because they allow you to change settings and use timers, to alter the chlorine output. Still, the chlorine level will rise and fall, based on spa usage and chlorine production. There is as new model, that is a lot smarter. 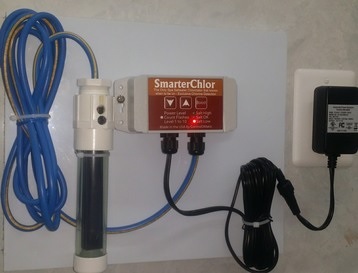 The SmarterSpa salt chlorine generator is smart enough to know when chlorine needs to be added, so it turns itself on. It also knows when the chlorine level has reached the top of the suggested range and so it shuts itself off. You never end up with an over-chlorinate spa. It operates independently of the pump and filter and requires NO installation. It sure sounds "just right" to me. I hope that this is what you're looking for. ► From Bromine To Chlorine? 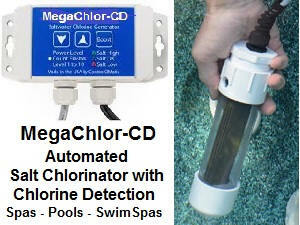 I just order a MINI salt chlorine generator, from your website store, and have a question.. I'll just use the bromine until it comes, then change out the water. Any suggestions on how to purge the tub before using the new chlorine generator? Should I only use chlorine until then? I'd like to stick to bromine if it's not going to cause an issue later. Thanks in advance. So long as there are bromides in the water, the chlorine produced will convert it to bromine. The chlorine, then becomes chloride ions. In a outdoor pool, the bromine would get destroyed much faster than chlorine, which can be stabilized against the Sun's UV rays. This makes it necessary to operate the salt chlorine generator at a higher output, which, in turn, shortens the life of the salt cell. However, in a spa, that is covered most of the time, there is no issue with the Sun's UV. 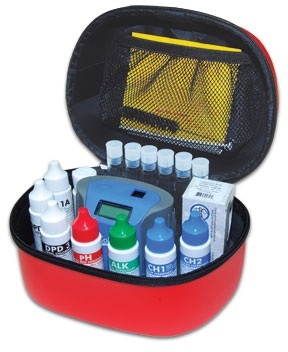 You can simply start using the salt chlorine generator and test, as if bromine is present. Once the spa is drained, it will be all chlorine, unless you add sodium bromide. Click The Above Images for Product and Ordering Information. ► Chlorine Or Bromine Generator? Which would you recommend, a bromine generator or a chlorine generator? We are getting a new spa and like the idea of only changing the water once a year. Please let us know if you think one or both of these would be a good choice. We have been told that the salt will wreck the equipment. Also is one easier on the skin than the other. Thank you. Not a simple group of questions! You can use a salt chlorine generator to produce bromine in a spa. A salt chlorination system should be fully capable of satisfying the sanitary demands of the spa, while avoiding many of the problems associated with traditional chlorine spa products. A typical bromine generator is probably more costly and not necessarily any better, as a spa sanitizer. There is also the possibility that sodium bromate will be produced and for this reason, I suspect, bromine generators have fallen out of favor. I am not at all sure about the once-a-year water replacement, as that might fly in the face of common sense. A lot depends upon your source water quality (calcium hardness and TDS) and the type of usage that the spa receives. The spa chemistry should be maintained in a manner similar to that of a typical chlorine or bromine spa, in order to minimize corrosive effects and to help assure optimum bather comfort. I hope that this information proves helpful Enjoy the spa experience. Alan, great site, I added you to my favorites list. I have checked into the various alternative spa sanitizers such as ozone and ionization and it seems that I still need to add chlorine or bromine -- perhaps at some reduced level. It doesn't make as much sense, if I can't give up the chlorine. If I use a salt chlorine generator, will I still need to add chlorine? Ozonators, Mineral Sanitizers and Ionizers are not complete sanitizers and require a backup. Chlorine or bromine is usually used for this purpose. Salt chlorine generators are complete sanitizing systems and need very little, other than chemicals to balance the pH and total alkalinity. During periods of very high bather usage, it may be necessary to dial up the chlorine output or, at the very worst, add some non-chlorine shock. If you have a salt chlorine generator and opt to add a mineral sanitizer, it will provide backup, persistent sanitation and allow you to the salt chlorine generator at a lower rate of production. I hope that I have been helpful. Hi there. I have a swim spa and have used a salt chlorinator system for close to 5 years. It has been great. The dealer that installed the spa and the equipment is no longer in business. I think that I need to replace the salt cell, as I have checked the salt level and cleaned the electrodes and still chlorine production is lacking. The control unit seems OK. Are these cells interchangeable? I'm afraid that I may have a problem locating a replacement cell, given the age of the unit. Any suggestions? You must use a cell that is equivalent to the one furnished with the salt chlorinator. Cells differ in terms of the number and size of the electrode plates. The dealer may not be around, but you might be to locate a replacement cell. There are companies the carry replacements cells for most salt chlorinators. You will find a few affordably priced salt chlorine generators for spas, in our Stuff for Spas Store. You might be better off replacing the whole unit. Good luck and I hope that I have been helpful. ► How Much Salt Is Required? I purchased a spa with the salt water chlorinator, and received no info for testing. I bought test strips for salt, but do not know what range the water should be on the rating. It is showing 2480 ppm on the strip. What should it be reading to know if it has enough salt in the water to be sanitizing it? Your help would be appreciated since I can't get help from spa company. Different salt chlorine generators have different suggested salt levels, ranging from 2500 to about 4000 PPM. Too much and it will shorten the life the cell. Too little and it probably will not produce enough chlorine. Usually the range is about 500 PPM. You could have enough or be 1000 PPM low. There is no way for me to know. Test the salt level and see where you stand. You should have received a manual outlined proper operation of the salt chlorine generator. Try and look for a brand name on the controller unit or cell and give them a call. If there is none, ask the supplier to replace the unit with a brand name product. I hope that this information was helpful. Editors note: The spa owner was able to find a manufacturer's name on the salt chlorine generator and was able to obtain the missing information, that the dealer failed to provide. ► Salt Chlorine Generator For A Spa? I found your topics discussing chlorine generators in spas. Could you please provide me with some brand names/models or sites that list them? Thanks so much. 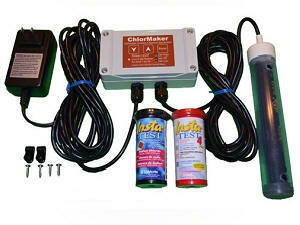 Salt chlorine generators can be used with spas. Smaller salt chlorine generators work well in a spas and hot tubs. You will find several, affordably-priced salt chlorine generators for spas, in our Stuff for Spas Store. It is the better way to do chlorine and eliminate the odor, handling and storage problems. Good luck and I hope that I have been helpful. ► Salt Chlorinator And Need To Shock? I recently added a salt generator to my hot tub because I was developing a skin rash from using chlorine. Bromine, which I also tried, wasn't any better. My water was not contaminated, as a skin rash might suggest. I maintain the water religiously. The salt generator has been a savior and no more rash. With a salt generator, do I still need to shock the water every now and then? Thanks in advance for taking the time to answer my question. A salt chlorine generator should meet the basic needs for sanitizing your spa. Most likely, you were sensitive to the irritating and odorous forms of combined chlorine and the salt chlorine generator should minimize their presence. Once a month, it might be a good idea to turn up the setting and produce a high 5 PPM level for an overnight period. This helps prevent resistant microorganisms from getting started. Otherwise, shocking should not be required, unless you see a loss of water quality or the free chlorine level has bottomed out. If you have an ozonator, run it along with the salt chlorine generator. It will allow you to favor the low end of the 1-3 PPM range, reduce the chlorine presence, make pH control easier and extend the life of the salt cell. I hope that this information proves helpful. Hi, I have a small spa that I manually add chlorine to. Can I convert to salt and manually add it like I do the chlorine now? Will salt affect the motor etc.? Thanks. Spas and pools that are using a "salt system" don't just add some salt. You need some equipment and about 2500-3500 PPM of salt added to the water. The equipment (salt chlorinator) converts the salt into chlorine. More information, on Salt Chlorinating Systems, is available. I hope that I have been helpful.